A business lobby group has unveiled plans for £200m Cardiff "crossrail" that it says is needed to help the city cope with housing and economic growth. Metro Consortium says tram-trains which run on both roads and rails are the way ahead after the planned electrification of south Wales' rail lines. It proposes crossrails east-west from St Mellons to the M4 at Creigiau and north-south from the M4 to the bay. Lobbyist Mark Barry said: "Transport is the backbone of regional development." In July this year, the UK government confirmed it would extend the planned electrification of the south Wales main line to Cardiff to Swansea and the south Wales valleys. Mr Barry said the electrification work, expected to start sometime between 2014 and 2019, would make Cardiff easier to reach from outside than it would be to travel across it by rail. His proposals say the city suffers from a relative lack of transport connectivity as its population is set to grow beyond 400,000 by 2026. He suggests a network of continental-style tram-trains as part of a "Cardiff crossrail". It would mean new stations places like Ely Bridge, St Mellons, Crwys Rd, Wedal Road [for University Hospital of Wales], Rover Way, Splott and Waterhall, phased over 10 years. The scheme would attract new rail customers and encourage economic regeneration locally, bringing a higher density of mixed-used growth in those areas, he said. A crossrail running from St Mellons to junction 33 on the M4 would use the electrified relief lines east of Cardiff Central railway station, the city line and the reinstatement of the old track from Fairwater to Creigiau. A north-south crossrail would run from junction 32 of the M4 on the Coryton line to the bay. There would be an interchange with the east-west line at Callaghan Square. Mr Barry said: "There are major development sites in the city, existing and new, which are not connected to the regional rail network. "It's not a really clever, coherent strategy where most of your major sites do not connect to your regional transport network. "Transport is not the be-all and end-all. It should be an enabler of development at key locations." He said improving transport connections within Cardiff would also help unleash economic growth potential across the region as more towns and businesses become accessible by the city's growing population. He said: "By better connecting Cardiff, you are also increasing the travel-to-work area of places like Newport, Pontypridd, and Caerphilly, which will allow them to play a more prominent regional role." His report states: "Whist this project is costly [perhaps £150m-£200m] it is affordable and can be delivered incrementally. "For example, when one considers that 40,000 new homes in Cardiff could secure a sales value of £6bn (at £150k per residence) then it would not appear unreasonable or unrealistic to secure a proportion of this value to contribute to the overall costs of the Cardiff Crossrail project." Mr Barry is an advisor for Metro Consortium, a group of business leaders, employers and developers, including Cardiff Business Partnership. Last year the consortium called for a £2.5bn over 10 years to connect Cardiff, Newport and the valleys with a "metro"-style rail network. Mr Barry's proposals are backed by Cardiff South and Penarth AM Vaughan Gething, chair of the assembly's cross-party group on rail. 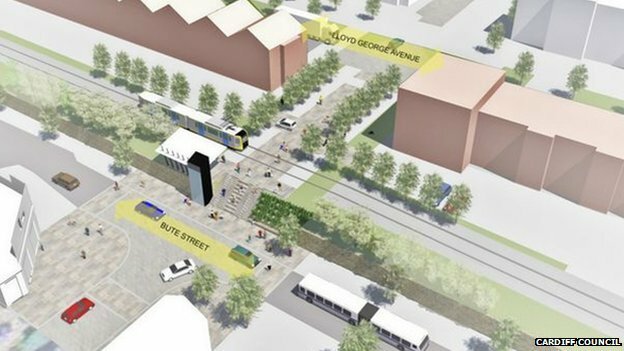 Plans for a metro-style train system in Cardiff could see a transport corridor developed into Rhondda Cynon Taf. Cardiff councillors are being asked to set up a task group to build a £220m regional transport network. Proposals include reusing an old line from Fairwater to Creigiau and improving links to Llantrisant and Pontyclun. At the meeting, Cardiff's cabinet could also ratify a 3.97% council tax rise to help save £50m from the council budget. The transport report said a regional metro system would encourage more people to leave their cars at home. Over 77,000 people commute into the city each day - 80% of them travelling by vehicle. And the number of commuters could rise with a further 30,000 properties planned to be built in the city to meet expected growth. For the last two years the Metro Consortium, with members including some of the biggest businesses in south Wales, has been looking at how the city region can continue to develop into the future with improved transport and infrastructure at its heart. It aims to improve access to the capital from the Merthyr, Rhymney. Gwent, Rhondda and Neath valleys, according to the report. The entire network, which could be built by 2030 subject to approval, could cost £4bn. Cardiff council is currently considering a north western corridor towards Rhondda, and councillors are being asked to appoint a group to take plans forward, such as identifying funding. Councillor Graham Hinchey, cabinet member for strategic planning and transport, said the regional metro system was "forward thinking" and would address the needs of a growing capital city. "It is essential to make public transport an attractive option by reducing travel times, improving the infrastructure and increasing availability by providing additional services," he said. "The new network looks to embrace electrification of existing networks, new technology such as tram-train and bus rapid transit, to make public transport attractive and a viable option for commuters." Initial estimates show that the first phase of improvements between Cardiff Bay and the city centre will cost £18m. The second phase would cost £44m and involve work around Callaghan Square connecting to Cardiff Central railway station. Reusing the disused City Line in Fairwater through to Cregiau and, with additional improvements, on to Rhondda Cynon Taf could cost a further £161m. You CAN now see what it is. Over the past few weeks Colin Sellers has produced images of a mural, that have puzzled some of us as to its content. All has now been revealed as a depiction of early horse tram transport in Chesterfield. The mural was the brainchild of the owners of the building H&F (Home & Furnishings) in New Beetwell Street, which overlooks the coach station, as well as the bus stands in the road itself. The painting (spray can and brushwork) has been completed by Peter Barber, a modern mural artist with grey acrylic paint applied to a basic cream coloured wall, and now provides very much a talking point in the town. As an aside of course, many in the local Chesterfield transport world will be quite aware, that 2014 is the 100-years Centenary since the Corporation's transport was established in the town. Will there be any other such celebratory events one wonders?